Don’t judge it by its minimalist design. 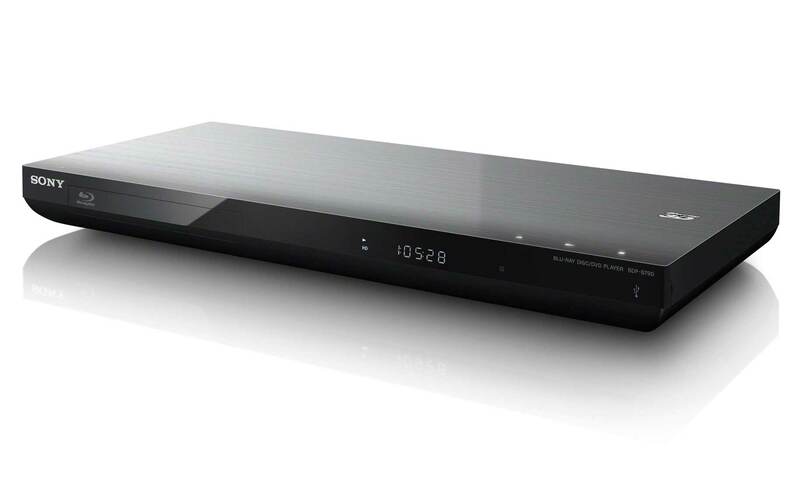 The understated body of Sony’s entry level Blu-Ray player is host to a gang of features that promise to turn any living room into an impressive multi-media hub. The Sony BDP-s790 is an excellent piece of kit. It’s Sony’s current top-of-the-range Blu-ray player (until the BDP-S5100 is launched next month, that is) and as such it’s crammed with all of Sony’s most advanced features and tricks. These include built-in Wi-Fi, access to Sony’s Entertainment Network and, for the first time on a Blu-ray player, 4K upscaling. The BDP-S790 is a slim and slinky machine, measuring just 42mm high with a curved underside to soften the angular geometric lines. The top half is gloss black, with a gorgeous brush effect on top and soft-touch controls along the front edge. Here you will also find a small LED display that’s just about readable from the sofa, the disc tray and a USB port are cleverly hidden under a flap located on the right hand corner. There’s a heavily populated rear panel too, which is a blessing in disguise when it comes to its ample connectivity options. With two HDMI outputs allowing you to feed signals to a TV and AV receiver separately, particularly useful if your receiver doesn’t support 3D signals. Joining these on the rear are optical and coaxial digital audio outputs, a composite output, analogue stereo output and a second USB port, which like the front one can be used to play back media files from external flash drives or HDD’s. There’s also an Ethernet port should you require the reliability of a wired Internet connection, but the deck boasts built-in WiFi allowing you to stream content from Sony’s online portal and your own files from DLNA servers. The BDP-S790 is the first of its kind, offering 4K upscaling in preparation of the eminent release of 4K displays, which may not be too far into the future. Upscaling any DVD or Blu-ray disc to 4K resolution )when connected to a suitable screen), may benefit performance over a built in upscaling option found within the display. Connect the S790 to the Internet, either via the ethernet connection or WiFi, and you’ll be able to access a wide array of web content, arguably the best available on any Blu-Ray player currently available on the market. This is largely due to the inclusion of a wide range of video-streaming and on-demand movie sites including the likes of BBC iPlayer, Demand 5, Netflix, LoveFilm and YouTube. And if that’s not enough, you’re also granted access to the Sony Entertainment Network, which includes its Video and Music Unlimited streaming services and 3D Experience. Social networking is also included in the S790, with applications for Facebook and Skype to help keep you connected while hiding yourself away in the den. And to make sure you are up to date with all of the goings on in the world Sky News, vTuner Internet radio, the Opera TV store with its own range of apps and even a web browser can be found living in the Xross Media Bar. Then we come to the deck’s impressive DLNA streaming functionality. You can play AVCHD, MKV, WMV, MP4, 3GP, AVI, XviD, MP3, AAC, WMA, WAV, JPEG, PNG and GIF from networked media servers, which is a good range but anyone hoping to play DivX files is out of luck. As well as 3D Blu-ray discs and DVDs, the BDP-S790 will play SACD, which gives those of us with a penchant for good quality sound something to look forward to. The BDP-S790’s picture quality is excellent with both 2D and 3D discs. Starting with 2D, picture quality is stunning through the S790 with every last pixel of detail from the disc and pumps it through the display with no sign of degradation. CGI landscapes are crisp with realistic textures, while complexities of real sets are rendered in all their hi-def splendor. The images are unsurprisingly cinematic, which is all down to S790’s deep blacks and wide contrast range. If you were so inclined you can play around with the custom adjustments to get things set up just the way you like, but even in the ‘Theatre Room’ preset, images are vibrant and punchy, really helping to sell those atmospheric scenes. Colour reproduction is also incredibly impressive, subtle shades are smoothly blended with no colour banding. The S790’s 3D performance carries on this trend, you’ll find yourself in a fully immersive experience, without compromising on quality. Everything the S790 pumps out looks good, from upscaled DVDs to web-streamed video from BBC iPlayer and the like. More tech-savvy users can control the S790 over a WiFi network using their iOS or Android smartphone or tablet. All thanks to Sony’s ‘Media Remote’ app, which offers full control over the player, with nifty little features like using your mobile device as a mouse for the web browser, that would be an afterthought in most scenarios. The BDP-S790 is ideal for someone that wants to de-clutter their entertainment space, and have everything all on one device. This is Sony’s entry level player, and with a price tag of £199-£230 ($290-$340), you can’t really go wrong. With similar functionality of a PS3 (obviously omitting gaming), with the added bonuses of 4K upscaling, easy media consumption and web browsing, this jack of all trades is great value. There’s no doubt a feature like the 4K upscaling may feel like overkill at this point in time, but for those of us with deep pockets or those who just want to consider themselves ‘future proofed’ should a plethora of 4K screens arrive in the near future the BDP-S790 is ideal. But looking past that, the Sony BDP-S790 is still a superb Blu-ray player, swimming in great features and excellent picture quality, a highly versatile network media player, Sony is definitely gearing up to take the top spot from the likes of the Panasonic offerings. ‹ ‘Surface’ it to say, you may be disappointed.